අද මම කියන්න යන්නේ සුපිරිම Photo Editing Software එකක් ගැන. 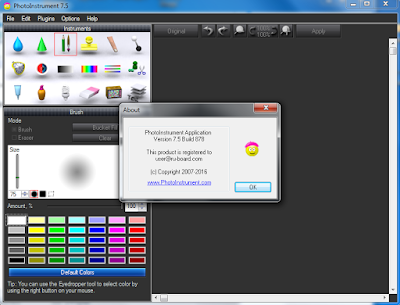 මේක හැබැයි Photoshop, Gimp වගේ සංකීර්ණ Photo Editing Software එකක් නම් නෙවේ. ඒ කීවේ ඒ Software එකේ ඒ තරම් Tools ගොඩාක් ඔයාලට දකින්නට ලැබෙන්නේ නම් නැහෑ මේකේ. ඒ ඔයාලගේ face එකේ වගේ ගත්තු Photo නම් ලේසියෙන් Edit කරන්න පුලුවන් විදියට ගොඩාක් Tools මේකේ තියෙනවා. මේ software එකේ ප්‍රයෝජන නම් ගොඩාක් තියෙනවා. අපි දැන් ගත්තා කියමුකෝ අපේ face එකේ photo එකක්. ඒ Photo එකේ තියෙන ලප කැලැල් , pimples වගේ ගොඩාක් ඒවා නැති කරලා උඩින් තියෙන පින්තූරේ වගේ ලස්සනට සකස් කරගන්න පුලුවන්. ඒ විතරක් නෙවෙයි මේකේන් fat අයගේ Photos පවා Edit කරලා සිහින් ලස්සන සිරුරක් තියෙන විදියට Editing කරන්න පුලුවන්. තව ගොඩාක් Photo Editing කරන්න පුලුවන් හැබැයි ඒ සේරම මම කියන්න නම් යන්නේ නැහෑ. 1. මුලින්ම ඔය Download Button එක click කරල "PhotoInstrument v7.5.878 Setup + Patch + Serial.rar" file එක Download කරගෙන Extract කරගන්න. 2. 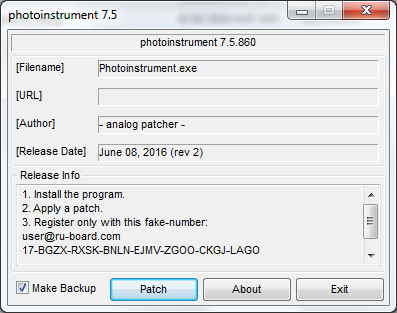 දැන් "PhotoInstrument_setup.exe" file එකෙන් මේක install කරගන්න. 3. දැන් ඔබ පරිගණකයේ Virus Guard එකක් ස්ථාපනය කර ඇත්නම් එය තාවකාලිකව Disable කරන්න. 4. දැන් Extract වූ files සමග ඇති Patch.exe ඒක Run as Administrator ලෙස ඔපෙන් කර Patch click කරන්න. "Cannot Find file, Search Now" ලෙස messege එකක් අවොත් කෙලින්ම Yes click කරලා manually PhotoInstrument.exe එක browse කරලා දෙන්න. සාමාන්යෙන් 32bit වල "C:\Program Files\PhotoInstrument\" හි හා 64bit වල C:\Program Files (x86)\PhotoInstrument\ හි මෙය ඇත. 5. දැන් Serial.txt එක ඇතුලේ තියන serial & email copy කරලා software එක open කරල buy now click කරලා Activation click කරලා paste කරන්ඩ.